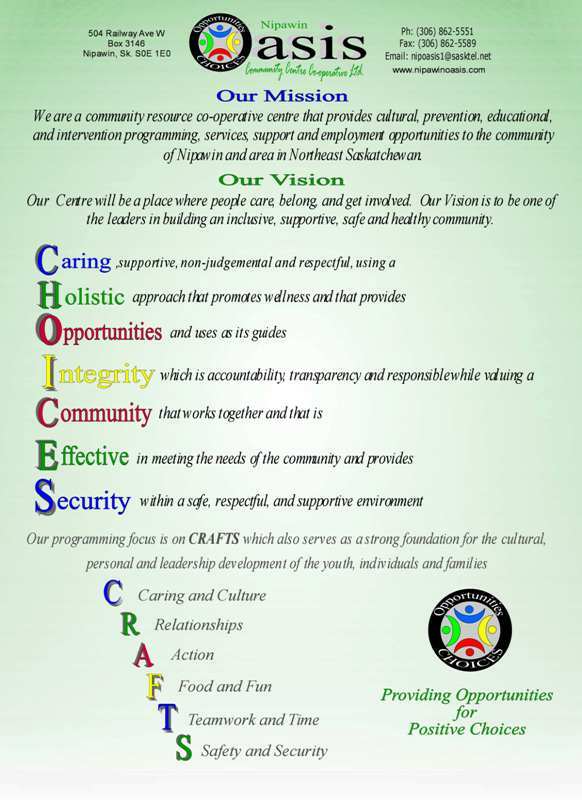 The Nipawin Oasis Community Co-operative Centre has a 20 year history of providing prevention, educational and intervention programming, services, support and employment opportunities to the community of Nipawin and area in North East Saskatchewan. Security with a safe, respectful, supportive environment. The Centre operates its activities and conducts its affairs under the Co-operatives, 1996 Act and is registered with the Saskatchewan Ministry of Justice with the Corporation Branch. The Community Centre is a non-profit co-operative and charitable organization that is registered with the Government of Canada and with the Canada Revenue Agency as a registered charity (click here to see financial report). The Board of Directors serve in a solely volunteer capacity of the Co-operative and are elected from the membership. The board employs a Chief Executive Officer and together strategically meet to review the Co-operative mission and objectives and identify potential risks and opportunities in consultation with stakeholders. In addition they review financial projections and establish priorities. The direction determined guides the operations of programs and services in the development of plans and annual goals. The Board of Directors meet on a monthly basis to review the progress of the operation in achieving program and service goals along with the monthly financial review. The Nipawin Oasis Community Centre Co-operative adopted the Canadian Centre for Philanthropy's Ethical Fundraising and Financial Accountability Code as its policy (October 2002).